Combine corned beef and water to cover in a large Dutch oven; bring to a boil then remove from heat. Drain. Add fresh water to cover. Add onion, carrot, parsley, bay leaf, and pepper. Bring to a boil once again, then reduce to a low simmer. Skim off foam, if necessary. Cover and simmer 4 hours or until tender. Remove onion and parsley. Add potatoes to Dutch oven. Simmer 10 minutes. Add cabbage wedges, and simmer 20 minutes or until vegetables are tender. Remove and discard bay leaf. To make the Irish Mustard Sauce, combine cornstarch, sugar, dry mustard and salt in a medium saucepan; stir well. Add water and cook over low heat, stirring constantly, until thickened. Remove from heat. Stir in vinegar, butter and horseradish. Gradually stir about 1/4 of hot mixture into yolks; add to remaining hot mixture, stirring constantly. Cook over low heat, stirring constantly, until thickened. 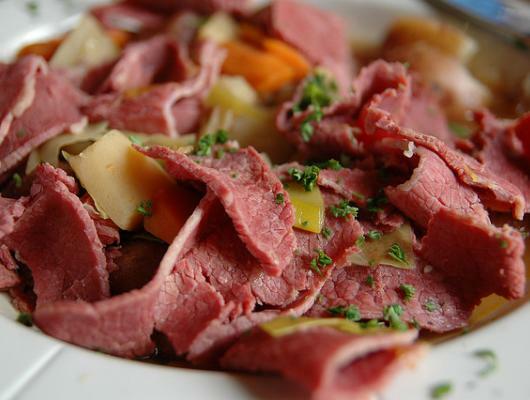 Transfer corned beef and vegetables to a serving platter. Serve with Irish Mustard Sauce. Yield: 6-8 servings. 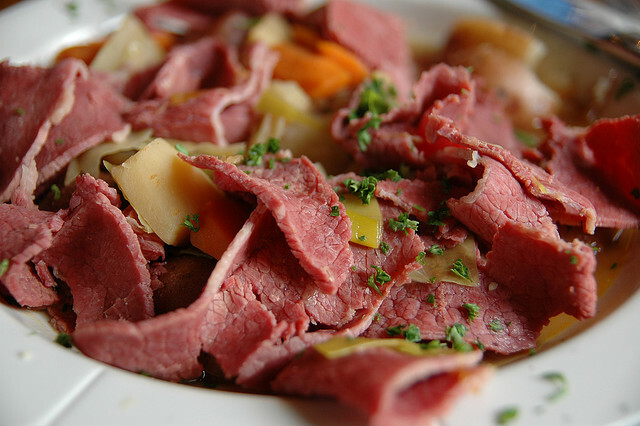 I love corned beef and cabbage...going to try it in a slow cooker, we'll see how it comes out!! Three thoughts: don't let it boil -- once it comes to a boil, simmer immediately. Boiling toughens it. Also, the recipe calls for one large carrot, but I always cook at least a pound of carrots (preferably with the greens still attached, but cut off before cooking -- they are far sweeter than the old ones in packages). Finally, the mustard sauce sounds great, but another good one is freshly grated horseradish mixed with sourcream. I would not add any root vegetables to the corned beef while it cooks. I would rather roast the root vegetables, including carrots, and serve them along with boiled or steamed potatoes. I often do my corned beef in my slow cooker (made it that way last night). I was hoping that you had a recipe for the mustard sauce. Sorry, it looks like the link to the mustard recipe broke! I've included the recipe in the instructions above. Cheers!